We’d love your help. Let us know what’s wrong with this preview of Tears in the Darkness by Michael Norman. Tears in the Darkness is an altogether new look at World War II that exposes the myths of war and shows the extent of suffering and loss on both sides. For the first four months of 1942, U.S., Filipino, and Japanese soldiers fought what was America's first major land battle of World War II, the battle for the tiny Philippine peninsula of Bataan. It ended with the surrender Tears in the Darkness is an altogether new look at World War II that exposes the myths of war and shows the extent of suffering and loss on both sides. The defeat, though, was only the beginning, as Michael and Elizabeth M. Norman make dramatically clear in this powerfully original book. From then until the Japanese surrendered in August 1945, the prisoners of war suffered an ordeal of unparalleled cruelty and savagery: forty-one months of captivity, starvation rations, dehydration, hard labor, deadly disease, and torture--far from the machinations of General Douglas MacArthur. To ask other readers questions about Tears in the Darkness, please sign up. The “Epic of Defeat” is history’s way of looking at the bright side of things. It says, “Hey, we might have gotten our asses kicked, but some day, it’ll make a great movie.” Western Civilization’s first “Epic of Defeat” was Thermopylae, where Leonidas’ merry band of Spartan Chippendales fought off a million Persians under Xerxes. Even though all the Spartans died, they saved Greece. America loves the “Epic of Defeat.” Probably because we’re an optimistic people who get defeated a lot. Heck, the The “Epic of Defeat” is history’s way of looking at the bright side of things. It says, “Hey, we might have gotten our asses kicked, but some day, it’ll make a great movie.” Western Civilization’s first “Epic of Defeat” was Thermopylae, where Leonidas’ merry band of Spartan Chippendales fought off a million Persians under Xerxes. Even though all the Spartans died, they saved Greece. Of all American defeats, none was greater than the loss of the Corregidor garrison on the Bataan Peninsula in the Philippines. In terms of gross manpower, it was probably the largest Army to ever surrender under the Stars & Stripes. Unlike Pearl Harbor, which became a rousing battle cry (“Remember Pearl Harbor!) – a key indicator of an “Epic of Defeat” – the fall of Corregidor is shrouded in shame and indignity. There were the initial blunders by Douglas MacArthur, that allowed the Japanese to send the American and Filipino troops into full retreat; there was the American Government’s inability to resupply the stranded soldiers; there was MacArthur’s nighttime escape on a PT boat; there was General Jonathan Wainwright’s surrender, and the death march that followed; there are those pictures of the survivors, shriveled and emaciated, true ghosts of Bataan. In Tears in the Darkness, Michael & Elizabeth Norman revisit the Bataan Death March and find the “Epic of Defeat” that is buried in the corpse-lined trails and the fetid, stinking prison camps. Unlike Thermopylae or the Alamo or Pearl Harbor, this “Epic of Defeat” is not a story of patriotism, of sacrifice for one’s country. Instead, it is the rather more meaningful story of human endurance; not man verses man, or man verses wild, but something far more primitive: man verses himself. Tears in the Darkness is ground-level, character-based history. For the most part, it follows the grunts, not the generals. For this reason, the book’s subtitle – “The Story of the Bataan Death March and Its Aftermath” – is misleading, because an editor somewhere screwed up the articles. It’s actually a story of the Bataan Death March. If you want a full overview of the battle, including troop dispositions, battlefield maneuvers, and a full accounting of Dugout Doug MacArthur’s mistakes, you will want to look elsewhere. This is not that type of book. The main character of the book – bearing in mind that by “character” I mean a real life person who is still living and breathing – is a young Montana ranch-hand with the Hemingway-esque name of Ben Steele. Ben, who later gained repute as an artist, and who’s sketches are featured in the book, is the spine of Tears in the Darkness. Indeed, for the first several chapters, in a literary ploy borrowed from The Naked and the Dead, the happenings in the Philippines are interspersed with flashback chapters to Ben’s life on the Great Plains. Having read a lot of war novels, I see the allure of this framework, the contrast between the heat, filth and violence of the jungle and the crisp, big-skied peace of the windswept Montana grasslands. However, it’s just too on-the-nose for my taste. Moreover, no matter how well written those Montana scenes are, they are a distraction, and their dramatic import pale in comparison to what is going on in Bataan. The flashbacks also add to the confusion of the opening chapters, which tend to jump around a lot. Though Ben is our protagonist, the Normans introduce several other soldiers, and follows them through arcs of various length. In and of themselves, many of these guys have stories worth telling; however, in the midst of everything else that is going on, it becomes hard to keep them straight. The first part of the book is saved by the inclusion of the stories of some Japanese soldiers. Without this input, Tears in the Darkness would have run the risk of caricaturing the Japanese as inhuman devils. Instead, a fuller picture – though one that still includes many ghastly instances of cruelty – is derived. The description of Japanese training methods was especially fascinating, in a sick sort of way. Essentially, learning to be a Japanese infantryman in the early 20th Century was like an extended Los Angeles gang jump-in. The lowest ranking soldiers were pounded on by the higher ranking soldiers, until the lower ranking soldiers were promoted, at which time, they started wailing on the guys below them. It’s classic violence conditioning, and without spelling it out, the Normans have provided some insight into how many (though certaintly not all, as American survivors themselves point out) Japanese soldiers were able to commit such atrocities against American and Filipino captives without flinching. The heart of the book is its second half, following the surrender of Corregidor. The Normans follow Ben and his companions on the infamous Death March, where they were tortured by thirst, hunger, and exhaustion, and where any stumble might end in death by gunshot or bayonet or a rifle stock to the skull. At the end of this road, hell awaited, prison camps so remote and deadly that guards were almost superfluous. When you read of the conditions there, you are left amazed that anyone could have survived at all, in body or in soul. Thousands of men were suffering from dysentery, and the ground where the prisoners were forced to sit and sleep became coated with layers of excrement, mucus, urine, and blood. Japanese sanitation units had dug slit-trench latrines, but so many men were sick that the open pits (some eight feet long, two feet wide, and four-to-five feet deep) filled after a day or so and started to spill over the edges. Hundreds of men, meanwhile, never made it to the latrines; they stumbled into the compound too enervated, too far gone to take another step. Helpless against the exigencies of the disease – the wrenching cramps and resistless urge to evacuate – they soiled themselves where they stood right through their clothing, then lay down half conscious in a pool of their own filth. As if the camps weren’t bad enough, the unluckiest prisoners of all were shipped to Japan on the so-called Hell Ships. These ships beggar description, though the Normans do an admirably shiver-inducing job of describing them. The ships were as terrible as the prison camps, with the additional horrors of darkness, suffocation, and claustrophobia. These things were so miserable, that their inevitable sinking by oblivious American subs and pilots must have come as a relief to many. Even the best narrative histories strive for some level of objectivity. With that objectivity, of course, comes distance between reader and subject. Tears in the Darkness is not a history book in that sense. It is striving for something more, and succeeds, mostly, as a great work of empathy. It invites you into a world of suffering and pain and cruelty and redemption, and it elides the big-picture warring of nations to focus instead on the small-picture struggle to survive, and to survive with one’s morality intact. I know that there are some out there that shy away from revisionist histories. The entire genre has gotten a bad reputation due to the power of the truly crank cases, whether it be Holocaust denial, Howard Zinn’s indictments on American History (or western civilization in general) or Pat Buchanan’s ode to Nazi Germany. Yet, there are plenty of other works that fall into the genre that are not meant to do anything more than to increase our understanding of the events of yesteryear. Tears in the I know that there are some out there that shy away from revisionist histories. The entire genre has gotten a bad reputation due to the power of the truly crank cases, whether it be Holocaust denial, Howard Zinn’s indictments on American History (or western civilization in general) or Pat Buchanan’s ode to Nazi Germany. Yet, there are plenty of other works that fall into the genre that are not meant to do anything more than to increase our understanding of the events of yesteryear. Tears in the Darkness is of this second order. Written by Michael and Elizabeth Norman, Tears in the Darkness is a fine example of how new histories should written. The authors have achieved a wonderfully rich narrative that manages to give the reader insight into the minds of all three sides of the battle for Bataan and the well-known aftermath. This look at the largest defeat in American History is needed to further explain just why it happened, something that many times has been lost with the depictions of the minutiae of individual histories and stories. The history is laid out into a dual track, as the chapters that are numbered tell the overall story and the named sections at the end of each chapter introduce and follow Ben Steele, the one survivor that had dealings with most aspects of Bataan, from being one of the garrison soldiers, battlers and prisoners. He was one of the defeated forced to march and then suffered the barbaric prison system that the Japanese put in place. One of the great aspects of this book is the inclusion of the Japanese point of view. What does get glossed over in many histories of Bataan is the fact that it was a defeat for America that could have been prevented, but the egoism of MacArthur as well as the inherent racism on all sides of the conflict did much to ensure that it would not be easy for wither side in the war. There is much benefit for researchers to see exactly how closed the Japanese system was, the devaluation of their own lives for the idea of Emperor and chain of command needed to be stressed, as we know that not all of the officers agreed with the policies of their governments. The inside look at the letters of the common soldier also was a nice plus. As we enter the 4th of July weekend, books like Tears in the Darkness should be added to reading lists for all interested in the continuing battle for freedom and history. I could not have asked for a more meaningful book at this point of year. In early 1942 the Japanese Army invaded the Philippines, landing on the largest island of Luzon. The Allies (Americans and Filipinos) under the command of Douglas MacArthur were less than prepared for the onslaught and were driven down to the southern peninsula of Bataan. MacArthur left his army under the supervision of Jonathan Wainwright and fled to Australia with his famous statement "I shall return". Without food, rampant with disease, and dying by the thousands, the Americans/Filipinos (72, In early 1942 the Japanese Army invaded the Philippines, landing on the largest island of Luzon. The Allies (Americans and Filipinos) under the command of Douglas MacArthur were less than prepared for the onslaught and were driven down to the southern peninsula of Bataan. MacArthur left his army under the supervision of Jonathan Wainwright and fled to Australia with his famous statement "I shall return". Without food, rampant with disease, and dying by the thousands, the Americans/Filipinos (72,000) surrendered on April 9, 1942. It was the largest defeat in American military history. And thus started the horror. The book has many levels - both American and Japanese viewpoints - in an attempt to clarify and explain the attitudes of each side toward their enemy. The author uses the device of following one American soldier, Ben Steele, who survived the Death March and was transported to Japan to work in the coal mines as slave labor. (He was freed in 1945,) But this is not a biography of Steels and his story is only part of the overall narrative as the reader also becomes familiar with various soldiers, both American/Filipino and Japanese and the particularly graphic descriptions of the Death March and the Japanese occupation of the Philippines. Jill Hutchinson It is worth it, Jan C. As I told some of my GR buddies, you don't know whether to weep or get sick. Pretty graphic but how could it not be? Disclaimer - my uncle survived the Bataan Death March, but died at Bilibid prison hospital in Manila just weeks before it was liberated. I read this to get a sense of what his 3 yrs in captivity must have been like. The book loosely follows the life of a Montana cowboy through the ordeal, though the cowboy gets sent to Japan as a slave laborer while it appears my uncle never left the Philippines. I was expecting the book to be full of Japanese atrocity against the prisoners and there is plenty of Disclaimer - my uncle survived the Bataan Death March, but died at Bilibid prison hospital in Manila just weeks before it was liberated. I read this to get a sense of what his 3 yrs in captivity must have been like. I was expecting the book to be full of Japanese atrocity against the prisoners and there is plenty of that. However, I think the authors do a good job of reminding the reader that nothing is ever completely black and white. They explain the brutality of the Japanese army in general and how the brutalized easily become brutalizers. Surrender was not an honorable option to a Japanese soldier so they were disdainful of Allied soldiers who surrendered. Significant questions are raised about the extent to which the Japanese commander (Gen. Homma)knew what was happening during the March. This book is such an important read and an absolute testament to the overall strength of the human spirit. Written from both American and Japanese perspectives, I found it unique and very well researched. An incredible story that will leave you speechless. A must read for history buffs. That people now understand MacArthur's failings. Here is the back story on Bataan: Everyone who has read "Tears in the Darkness" by Michael Norman calls it the best of the best, and I agree. Here is what I know about the events that led to the horriffic Bataan Death March. On Pearl Harbor day, church bells pealed from cupolas in Manila, the sounds cresting, suspended, and six-inch long monkeys went swinging from lily to lily as if the flowers were trees. In Malacanan Palace, cleaning men polishe That people now understand MacArthur's failings. Here is the back story on Bataan: Everyone who has read "Tears in the Darkness" by Michael Norman calls it the best of the best, and I agree. Here is what I know about the events that led to the horriffic Bataan Death March. On Pearl Harbor day, church bells pealed from cupolas in Manila, the sounds cresting, suspended, and six-inch long monkeys went swinging from lily to lily as if the flowers were trees. In Malacanan Palace, cleaning men polished the ballroom floor by skating over it on banana leaves, chefs prepared sweets called bibingka, and florists filled vases with fragrant purple frangipani and yellow butterfly orchids. Tonight the twelve hundred men of the 27th Bombardment Group would host a glamorous party. Douglas MacArthur swept out of the party, making elaborate gestures of farewell to his admirers, and returned to his penthouse apartment. At three in the morning, the telephone screamed into his sleep. MacArthur jumped out of bed, looking as if he had hit an electric fence. He quickly shaved and dressed in uniform, took stock of himself in the mirror. His waist had thickened, and he slicked his hair across a balding head. He had steely eyes and large-pored skin, well tanned and glistening with lotion and a row of large square teeth huddled behind thin, dry lips. His narrow face formed a rectangle. He called his Chief of Staff, Richard Sutherland, and a few key advisors for a meeting at headquarters. They came at a gallop. Sutherland warned that the Japanese would bomb the Philippines next, and MacArthur needed to get his planes in the air and out of reach. Though eager to gloriously defend the Philippines and win more medals, MacArthur replied there was no hurry as far as he was concerned. The Japanese would not strike before January 1, so he would disperse the aircraft later on. He lit his corncob pipe. The flabbergasted Sutherland desperately explained that Japan would strike immediately to avoid the usual January storms that hamper visibility. Clark Field’s planes should instantly head north to bomb Formosa or south out of danger. Captain Joseph McMicking agreed. “Stand by and wait,” MacArthur replied, twirling the pearl handled pistol he always packed. Sutherland averted his eyes; he had never been able to endure MacArthur's fixed gaze for long. He looked out on Manila Bay toward the island of Corregidor and, on its right, the Bataan Peninsula. If the Japanese invaded and overran Manila, MacArthur could retreat to the peninsula and from there to the island. He urged the general to quickly stock the two areas with ammunition, medical supplies and gas, while they still could. MacArthur raised his fist, and, in a shrill, piercing voice, proclaimed that his men would never retreat. After all, he had spent the past four years training them. He began pacing, his arms moving back and forth, while he orated about his loyal troops, describing their impregnable defense strategies. They would thrash the enemy back into the sea in a matter of days. Two days later, the Japanese bombed Manila Bay until the antennae and funnels of sunken ships bobbed above the surface of the water like crosses. Chaos rippled through the city as looters roamed the streets, hotels emptied, and the last army horse unit, the 26th Cavalry, rode out of Fort McKinley. As the horses and their riders galloped north to head off the Japanese, the Filipinos waved good-bye to them. Reading about Douglas MacArthur’s conduct during World War II becomes curiouser and curiouser as you go along, at least that was my experience. Brilliant, charismatic, worshipped and hated, he could be noble or despicable. Eventually I decided the tangle of his character, though obscured by intellect and dazzle, defined the man. Unfortunately, his claim that he did not need to stock Bataan and Corregidor turned out to be another tragic error. On December 22, Japanese troops invaded the main Philippine island of Luzon, and in no time, MacArthur's men beat a retreat to Bataan and Corregidor. Without adequate provisions, they soon began dying from starvation and malaria, as well as enemy firepower. Ignoring them, he busied himself issuing 109 press releases describing himself as “The Lion of Luzon” and “going in everywhere.” With the tenacity of a fly hitting a window, he kept repeating his mantra. Pair an eager press with a man enamored of self—expression, and you have a fine romance. On February 22, 1942, Roosevelt decided the general could not save the Philippines and ordered him to leave for Australia to plan a counteroffensive. MacArthur eagerly agreed, and off he went. Some staff members accompanied him, the Filipinos motivated by a hope of helping their country, more than adoration of him personally. He wanted his wife and son to leave Corregidor in a submarine, but she said she had drunk from the same cup as her husband and would stay by his side. Water had soaked the "scrambled-egg" cap he had nicknamed with the fondness he accorded everything involving himself, so he promptly sent it to a hat stretcher. 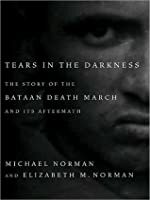 Michael Norman and Elizabeth Norman wrote an incredible book when they wrote Tears in the Darkness: the Story of the Bataan Death March and Its Aftermath. The surrender of more than 76,000 American and Filipino troops on the Bataan peninsula is not a part of World War II that I learned much about in history classes, and I am so thankful that I stumbled upon this book at the library. Captivating and well-written, this book also dredged up academic memories from college experience at Whittier Colle Michael Norman and Elizabeth Norman wrote an incredible book when they wrote Tears in the Darkness: the Story of the Bataan Death March and Its Aftermath. The surrender of more than 76,000 American and Filipino troops on the Bataan peninsula is not a part of World War II that I learned much about in history classes, and I am so thankful that I stumbled upon this book at the library. Captivating and well-written, this book also dredged up academic memories from college experience at Whittier College. Initially, I found some of the facts so horrific and disgusting they were nearly unbelievable. And then, I found myself intensely disappointed with a four-star general; so disappointed that I started to think about the classes I took on history and theory. This general is so celebrated, and when I read what he did, I wondered why this bit of his military career is kept so quiet. Then I remembered how history is an account influenced by a historians experiences, the questions they ask and the answers they seek (something I learned at Whittier). Even now, after I finished the book, I wonder what made the authors chose to tell this particular story in this way. Tears in the Darkness is told from the American point of view, I found that the Normans also give you a flip-side perspective, so you cannot help but question our own country's actions. I was prepared to love this book in a really emotionally moving way; but ultimately I was disappointed by several aspects of Tears in the Darkness. I commend the author on his research and presentation of the individual stories of many of the participants in the Battle of Bataan and subsequent tragic events. The March itself was horrifying, of course. And then, all of a sudden, the reader is thrown into the "unfair" trial of General Homma, who is portrayed as merely a victim of circumstance who I was prepared to love this book in a really emotionally moving way; but ultimately I was disappointed by several aspects of Tears in the Darkness. I commend the author on his research and presentation of the individual stories of many of the participants in the Battle of Bataan and subsequent tragic events. The March itself was horrifying, of course. And then, all of a sudden, the reader is thrown into the "unfair" trial of General Homma, who is portrayed as merely a victim of circumstance who is railroaded by the U.S. Government. I'm sorry, but I don't find it so outlandish to hold a superior officer responsible for the actions of his subordinates, especially when these actions are atrocities of epic proportions performed in plain sight over a substantial period of time. Perhaps Masaharu Homma was just a really nice guy who happened to be in the wrong place at the wrong time. Boo Hoo. General Douglas MacArthur is presented as a true villain in the story. I admit that my knowledge is insufficient to judge the man or his actions, but I find it hard to believe that the extremely pejorative portrayal of him by Michael Norman is accurate and unbiased. It is a true story of tens of thousands of American and Filipino POW's forced to march to their prison by the Japanese during WWII. Even though everything in the book is factual, it read like a fiction. The authors did extensive research from countless books, records, newspapers, diaries, and interviews. And I appreciate that the authors stayed neutral throughout the book and offered bits of accounts from both American and Japanese sides; there were plenty of stories within the book to contradic It is a true story of tens of thousands of American and Filipino POW's forced to march to their prison by the Japanese during WWII. Even though everything in the book is factual, it read like a fiction. The authors did extensive research from countless books, records, newspapers, diaries, and interviews. And I appreciate that the authors stayed neutral throughout the book and offered bits of accounts from both American and Japanese sides; there were plenty of stories within the book to contradict the myths and stereotypes of the two races. Having a grandfather who fought in the Japanese Imperial Navy during WWII and later taken in as a POW by the Americans, I felt this story very close to me. My grandfather told me about his experience during the war and how well he was treated by the Americans and the native people of New Zealand where he was taken as a prisoner; it transformed his view of life forever. It was common for the Japanese soldiers to die in honor of the emperor and my grandfather was no exception. However, as he got to see the kindness and hospitality of his enemy and captors, he started to change his mindset. Because of this, I felt embarrassed and ashamed at how the Japanese treated their POW's and forced them into slave labor. Released in June of 2009, Tears in the Darkness is the story of the Bataan Death March and the POW camps of the Japanese in the Philippines and Japan. Absolute must read. I was hesitant about this purchase because it seemed like such a depressing story. But it was actually an exciting read and life-affirming. My one criticism concerns the authors' viewpoint about the executions of Gen. Homma and other senior Japanese military leaders for war crimes. The authors believe these executions were unjus Released in June of 2009, Tears in the Darkness is the story of the Bataan Death March and the POW camps of the Japanese in the Philippines and Japan. Absolute must read. I was hesitant about this purchase because it seemed like such a depressing story. But it was actually an exciting read and life-affirming. My one criticism concerns the authors' viewpoint about the executions of Gen. Homma and other senior Japanese military leaders for war crimes. The authors believe these executions were unjust. Prior to these trials, there was no precedent for prosecuting war crimes against leaders who were not actually present during atrocities, but who had ultimate command of the prison camps where American, British, and Phillipino pow's were tortured, starved and killed. The Japanese committed so many atrocities and yet only a small number were executed for war crimes. Homma and Yamashita were tried by military tribunals with very loose rules of evidence and with "jurors" who were hardly impartial. So the trials were hardly fair by American standards. MacArthur drew up the charges himself, and he got the verdicts he wanted. While Homma and Yamashita may not have been given due process, it does not necessarily follow that Homma and Yamashita were innocent. The evidence is fairly strong that the POW treatment was a deliberate policy and a product of Japanese attitudes about the supposed cowardice of those who surrender. If a commander fails to commit any resources to feed, transport, and house prisoners, and also turns a blind eye toward torture, even though responsible for training and oversight of prisons, then I say death by firing squad is a just sentence for that commander. The authors seem to think Homma's death turned on whether he was in some car that drove by during the Bataan death march. Whether that occurred made no difference to me. Just how did Homma expect 100,000 starving prisoners to march 70 miles chained together in 100 degree heat in just a couple days without any food and water? But the book was still outstanding. General Homma's sentence of death was just, and if anything, many more Japanese soldiers should have been prosecuted. While reading Unbroken by Laura Hillenbrand I became interested in the Bataan Death March of WWII. I had heard about it growing up. My uncle was a Death March survivor. I was told the ordeal had changed him. He was not the same man who had left for war. After reading Tears in the Darkness I understand why. The Death March and the events after, forever changed the men and women serving in Philippians during WWII. Along with the story of the Bataan peninsula, the authors followed the stories of oth While reading Unbroken by Laura Hillenbrand I became interested in the Bataan Death March of WWII. I had heard about it growing up. My uncle was a Death March survivor. I was told the ordeal had changed him. He was not the same man who had left for war. After reading Tears in the Darkness I understand why. The Death March and the events after, forever changed the men and women serving in Philippians during WWII. Along with the story of the Bataan peninsula, the authors followed the stories of other men, and one man in particular Ben Steele, from Montana. A cowboy before the war, Steele became an artist during the war. Some of his stretches are scattered throughout the book, giving the story continuity and a depth. What surprised me was as horrible as the Death March was, for 3 more years; things went from bad to even worse. The story continues from the March to the concentration camps, and then the hell ships. The hell ship were how the Japanese transported allied soldiers and Japanese personnel and their families to Japan. As I read this book I wished my uncle could have told me where he fit in the story. The closest I got was reading about a man from my uncle’s hometown. Tears in the Darkness tells such a horrific tale it is astounding anyone lived to tell about it. This remarkable book was sent to me by K.D., a GoodReads friend from the Philippines, because I had expressed an interest in learning more about his country. As K.D. had explained, it’s an American book, focussed primarily on their experiences as POWs under Nippon, but because the notorious Bataan Death March took place in the Philippines, the victims also included Filipino soldiers. The numbers are appalling: of 75,000 captives, 67,000 were Filipinos, 1,000 were Chinese Filipinos, and 11,796 we This remarkable book was sent to me by K.D., a GoodReads friend from the Philippines, because I had expressed an interest in learning more about his country. As K.D. had explained, it’s an American book, focussed primarily on their experiences as POWs under Nippon, but because the notorious Bataan Death March took place in the Philippines, the victims also included Filipino soldiers. The numbers are appalling: of 75,000 captives, 67,000 were Filipinos, 1,000 were Chinese Filipinos, and 11,796 were Americans. Approximately 5,000–10,000 Filipino and 600–650 American prisoners of war died en route to their destination, Camp O’Donnell, from where they were eventually shipped as slave labour. This is a must-read books for all Filipinos. Once again, it tells us not only what atrocities Japanese and injustice Americans did to Filipinos. I wish that there will be a cheaper version of this book so that it will be more affordable to us. Tata J lent me this 1st edition (2009) book that he bought at around US$20. Thanks again, Tata J for another perspective- if not life-changing book! This is my 3rd book read this year alone on what happened during World War II here in the Philippines. Last This is a must-read books for all Filipinos. Once again, it tells us not only what atrocities Japanese and injustice Americans did to Filipinos. I wish that there will be a cheaper version of this book so that it will be more affordable to us. Tata J lent me this 1st edition (2009) book that he bought at around US$20. Thanks again, Tata J for another perspective- if not life-changing book! This is my 3rd book read this year alone on what happened during World War II here in the Philippines. Last April, I read John A. Glusman's COURAGE UNDER FIRE (2004) and in August, Louis Morton's FALL OF THE PHILIPPINES (2005). If COURAGE is about four American doctors who were assigned in Corregidor hospital, this book TEARS IN THE DARKNESS is about a American private soldier Ben Steele, a ranger in Montana, who experienced each stage of the war from the bombing of Clark, to the retreat to Bataan, the eventual surrender, the work camp in O'Donnell, ride on the hellship to Japan, Japanese surrender, his return to the USA but most especially the highlight of the book - THE BATAAN DEATH MARCH. If the FALL OF THE PHILIPPINES is about the fall of the whole country including its facts and figures making it a plan historical book, TEARS is written just like your amazing war novel. The writing is crisp, incandescent without being melodramatic. It also gives a balance view by having almost half of the book to the Japanese characters. Even the trial of Homma (because this was not tackled in the other two books) kept me guessing for the outcome. My only regret is that there was not a single Filipino main character. It was often said that Americans and Filipinos fought the Japanese side by side and Filipinos even consider Americans their big brothers. Just like what Tata J said, it could have been more balanced if the bravery and gallantry of Filipino soldiers were also highlighted in the book. After all, Philippines had more casualties compared to Americans and Japanese combined. In any of the 3 books, Filipinos are described as untrained (except the Filipino scouts who were trained by the Americans), ill-equipped (coconut husk as helmet and canvas shoes) and always count on the Americans to save them. This dependency to Americans is something that we are slowly shaking off. We made the right decision not to renew the military bases agreement in 2001 (or was it because of the Pinatubo volcano?). However, most Filipinos still welcome the intervention of America to help settle our political or economic issues. This is similar to what most Filipinos of today still think of Gen. Douglas McArthur. That he was an American hero to us having a major thoroughfare in Luzon named after him. However, as this book again illustrates, he was a coward by having violated one of the most important rule in any battle: A good soldier does not leave another soldier behind. He left our Filipino soldiers suffering for 3 years - hoping each day that he would fulfill his promise to return. The death march was covered in details in this book. If you do not get teary-eyed while reading the actual accounts of that 66-kilometer walk under the hot April tropical sun - with no food and water - and with the Japanese soldier not wanting you to break the line (otherwise, you would be killed or punished), you have a heart of stone. This was the book I was reading during the typhoon Ondoy onslaught last Sept 26-27 and when I saw Filipinos complaining of being foodless for 1-2 days, I told myself that it should be nothing compared to what Filipinos and Americans suffered in the hands of the Japanese soldiers. An incredible chronicle of the events leading up to, surrounding and following the Bataan Death March, April 1942. The protagonist in this non-fiction chronicle is Ben Steele, a native of Billings Montana and still with us. Ben's story is interwoven with material from diaries and journals as well as other source material from those Americans, Filipinos and Japanese who were there. Ben, developed the ability to sketch while a captive and his sketches are scattered throughout the narrative. This st An incredible chronicle of the events leading up to, surrounding and following the Bataan Death March, April 1942. Ben, developed the ability to sketch while a captive and his sketches are scattered throughout the narrative. This story is not for the faint-hearted as the descriptions of what, not only the defenders went through, but also the Japanese aggressors is the stuff of nightmares. The authors intersperse the description of events in 1941-46 with flashbacks of Ben Steele's earlier years. They cover the impending conflict with Japan, the invasion, the Battle of Bataan, The Death March, the prisoners life as captives at Camp O'Donnel, the Bicol peninsula, Bilibid prison and hospital, Camp Cabauantan, the hellships and the mines of Japan, all places Ben Steele survived. The book ends with Ben as a survivor, art student,family man and eventually an art teacher at Eastern Montana College in Billings. The authors also added a non-essential chapter on the trial of General Homma who commanded the Japanese forces in the Philippines. They obviously sympathized with the General and try to show that he really had no idea of what was going on but was railroaded in a trial and eventually executed by firing squad. The authors are also less than admiring of General MacArthur and take many opportunities to imply he was less than a great leader. This was an excellent history of World War II and the Bataan Death March. Some reviews have called it revisionist history, but maybe it was just the truth coming out. As school children, we were taught about the greatness of MacArthur, but my dad, who served in the force that liberated Bataan, never had a lot of good things to say about the general. If the views held in the book are as common as I now think, I understand why my dad felt the way he did and who others do also. MacArthur left his This was an excellent history of World War II and the Bataan Death March. Some reviews have called it revisionist history, but maybe it was just the truth coming out. As school children, we were taught about the greatness of MacArthur, but my dad, who served in the force that liberated Bataan, never had a lot of good things to say about the general. If the views held in the book are as common as I now think, I understand why my dad felt the way he did and who others do also. MacArthur left his men to the Japanese and left the Phillipines just before the Japanese overran the island of Luzon. The soldiers and civilians left behind were terribly treated by the Japanese occupiers. Japan did not recognize the Geneva Convention, so the captives were tortured, starved, made to march from place to place. Some of the POWS were conscripted to go to Japan and work at various jobs, including coal mining. This is an excellent overview of the fall of the Philipines during 1942 and the subsequent trials endured by Allied POWs. Although the authors introduce us to many men who made the Bataan Death March, they wisely focus on a young Montanan, Ben Steele, who preserves the atrocities committed in enemy custody through his drawings. The Normans also cover the military tribunal that heard the case of General Homma who was in command of the Philipine campaign. Absolutely fantastic! I attended a book-signing and met the authors and Ben Steele himself. He is an awsome man. What a great story. So much better than Bill Sloan’s book on the same topic; the book deals not just with the American view but also a Japanese perspective; including General Homma’s Trial. Again this books shows how miserably McArthur defensed the Philippines ; to a far greater extent than Sloan’s book. No General Lincoln ever fired did a worse job. Obviously different individuals are followed so if you are very interested in the topic; there is a place for this and Sloan’s book; but this is the better one by far. This review has been hidden because it contains spoilers. To view it, click here. Tears in the Darkness: The Story of the Bataan Death March and Its Aftermath, by Michael Norman, is the story of the Bataan Death March as seen through the eyes of Ben Steele, a cowboy who enlisted in the Army Air Corps and was sent to the Philippines. While Ben is the main character, this book also shows the perspectives of other soldiers, including Japanese soldiers and officers. Norman uses a combination of interviews and journal entries from the soldiers and sketches drawn by Ben to paint a Tears in the Darkness: The Story of the Bataan Death March and Its Aftermath, by Michael Norman, is the story of the Bataan Death March as seen through the eyes of Ben Steele, a cowboy who enlisted in the Army Air Corps and was sent to the Philippines. While Ben is the main character, this book also shows the perspectives of other soldiers, including Japanese soldiers and officers. Norman uses a combination of interviews and journal entries from the soldiers and sketches drawn by Ben to paint a very graphic picture in the reader's mind. The story switches between the soldiers on the March and Ben's childhood back in the States. On Bataan, the story starts with the siege of the peninsula by the Japanese, and it uses this time to introduce some of the recurring characters. The American and Filipino troops surrender because of major supply shortages, and General MacArthur is forced to flee the island with the hope that he can retake Bataan and free the prisoners. For the rest of the soldiers, the Death March begins. The Japanese then divide the Americans into large groups and set them marching towards villages to be corralled. The Japanese soon realize that they have too many prisoners, so the Americans have to keep marching until their captors can find some way to deal with all of them. Many soldiers die from thirst. Many die from hunger. Many die from exhaustion. Many are lined up and killed outright. Many months passed before the Japanese got their prisoners onto the boats to send them off to Japan, where they suffer under Japanese imprisonment. Those who survived would remain there until the Japanese surrendered in 1945. Several Japanese officers were tried for war crimes, although the Japanese general is portrayed as kind, noble, artistic, and unaware of the atrocities being committed by his men. I liked how the book doesn't make the Japanese seem like crazy, reckless soldiers who went to war to die. Many books about WWII portray the Japanese as extremely antagonistic people, but this book works hard to show how human they are. Had a hard time deciding between 3 and 4 stars. Ultimately went with 4 because of all I learned from this book. I was aware of the Bataan Death March but never knew about the specifics of the March and the atrocities that followed. General Douglas MacArthur played a major role in the American defeat and the plight the solders were left in on the Bataan Peninsula. Throughout the conflict and even after defeat, he failed to acknowledge his responsibility for his actions and was even awarded a Meda Had a hard time deciding between 3 and 4 stars. Ultimately went with 4 because of all I learned from this book. I was aware of the Bataan Death March but never knew about the specifics of the March and the atrocities that followed. General Douglas MacArthur played a major role in the American defeat and the plight the solders were left in on the Bataan Peninsula. Throughout the conflict and even after defeat, he failed to acknowledge his responsibility for his actions and was even awarded a Medal of Honor. He escaped and left his troops in the horrible situation he brought upon them. The book claims to follow the story of one soldier, Ben Steele, a young cowboy from Montana. However, the author did a very poor job of following Ben's story until the 2nd half of the book. Throughout the book, there are random awkardly-placed flashbacks to Ben's life in Montana. After very informative descriptions of the Death March and the horrible conditions and brutalities the American and Filipino POWs endured for the 3 years following the March,the author failed to give a clear picture of the years after the end of the war, both in Ben's life and that of other POWs. Instead, he concentrated on what he, the author, believed was the unfair conviction of the Japanese General Homma in the post-war trials of Japanese war criminals. I agree that MacArthur should have had no role in these trials but I also believe that General Homma should have known what his officers were doing to the POWs. If he did not, as the author apparently believed, the author should have provided the information on who was making the decisions regarding POW treatment and why General Homma was oblivious to these decisions. Michael Norman does a great job of illustrating the unimaginable horrors that Ben Steele and his comrades endured on Bataan and throughout their 3-year ordeal as POWs in Japan. His glimpses of the Japanese experience as well are enlightening, particularly the hohei diaries which literally give unprecedented firsthand Japanese accounts. The brutality extends far beyond anything I've read prior, and it's one of those rare stories that truly makes you appreciate everything you have--even the little Michael Norman does a great job of illustrating the unimaginable horrors that Ben Steele and his comrades endured on Bataan and throughout their 3-year ordeal as POWs in Japan. His glimpses of the Japanese experience as well are enlightening, particularly the hohei diaries which literally give unprecedented firsthand Japanese accounts. The brutality extends far beyond anything I've read prior, and it's one of those rare stories that truly makes you appreciate everything you have--even the little things we typically take for granted. While I enjoyed the book as a whole--and particularly appreciated the insight into the remarkable life of Ben Steele--Norman's writing style eventually began to wear on me. For instance, the stylistic decision to consistently refer to characters by their full name--in some cases, several times per paragraph. As far as I can recall, not once in his 480 pages did Norman refer to Ben Steele as "Ben" or "Steele"; always "Ben Steele." This is true for several other names in the book as well, with the exception of a few Japanese. Another area I take issue with is how Norman makes no secret of his contempt for Gen. Douglas MacArthur and his role in the surrender; but this contempt only really serves to undermine what should have been an unbiased account of this tragic episode in the war. The criticism of MacArthur is justified, but Norman's perceived bravado in delivering it tends to cheapen it. There are moments where this book absolutely soars, and Ben Steele certainly emerges as a real and VERY memorable person you will undoubtedly care about. But there are also a number of times where the narrative doesn't quite hold its own. Michael Norman, is the co-author of TEARS IN THE DARKNESS: The Story of the Bataan Death March and Its Aftermath (2009), a work of narrative non-fiction that was on the New York Times bestseller list for eight weeks and was picked by Times critic Dwight Garner, as well as o Librarian Note: There is more than one author in the GoodReads database with this name. See this thread for more information. Michael Norman, is the co-author of TEARS IN THE DARKNESS: The Story of the Bataan Death March and Its Aftermath (2009), a work of narrative non-fiction that was on the New York Times bestseller list for eight weeks and was picked by Times critic Dwight Garner, as well as other reviewers, as one of the top ten books of year. He has also written THESE GOOD MEN: Friendships Forged in War, a memoir published to critical acclaim in 1990. He is a former reporter and columnist for The New York Times national, foreign and metropolitan desks and was the inaugural writer for the following New York Times columns: "A Sense of Place", a monthly column that explored the dislocations of modern life in one suburban town; "Lessons", a national column on education; and "Our Towns", a twice-weekly column on life outside New York City.